H.E. President Maithripala Sirisena and thousands of yoga enthusiasts celebrated International Day of Yoga at Independence Square in Colombo on June 23 despite rain. President practiced a number of yoga asanas and thanked yoga institutions in Sri Lanka for their excellent efforts. 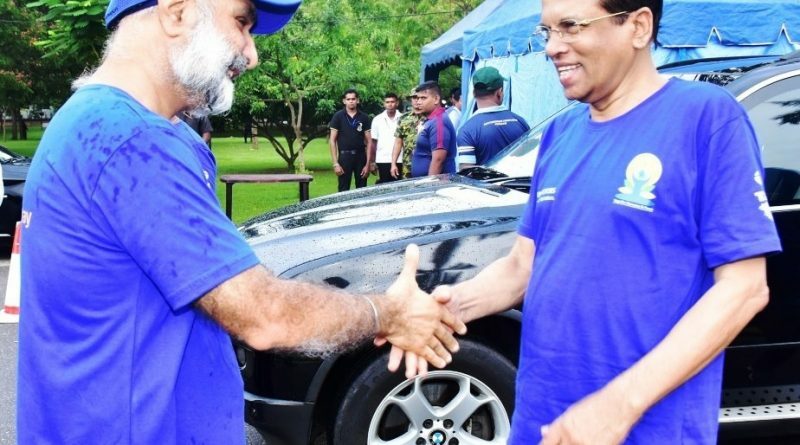 The event was attended by a number of Sri Lankan Ministers and officials, apart from public at large, including professionals, doctors, academicians and cultural personalities, cutting across all religions and ethnicities. H.E. Taranjit Singh Sandhu, High Commissioner of India, welcomed H.E. President. The Yoga celebrations started with a video message from Prime Minister of India Narendra Modi. High Commissioner highlighted the global efforts led by Prime Minister Narendra Modi, to spread awareness about Yoga. “Yoga brings peace by combining the body, mind, spirit and soul. Yoga brings harmony in the family, society, nation and the world”, he added. High Commissioner also underlined the interest of H.E. President in health issues and admired the continued whole hearted support of H.E. President and people of Sri Lanka for the healthy practice of Yoga. The event was organized by the Swami Vivekananda Cultural Centre in collaboration with Ministry of Culture, Government of Sri Lanka, and eminent Yoga institutes of Sri Lanka such as Astanka Yoga Mandir, Sethsada Yoga Nikethanaya, Hatha Yoga Centre, Aum Kriya Babaji Yoga Aranyam, National Youth Services Council Sri Lanka, Institute of Human Excellence, Brahma Kumari Raja Yoga Centre, The Art of Living, AAYUSH, My Yoga Lounge, Sakthi Anand Yoga School (Batticaloa).